A total solar eclipse occurs when Earth's Moon passes across the disk of the Sun. This effectively blocks out the solar disk during the time of eclipse totality. At this time, the corona, or the sun's extended atmosphere, is visible to the naked eye. Faint features on the disk of the Moon are visible due to illumination by reflected light from the Earth. This illumination is called earthshine. 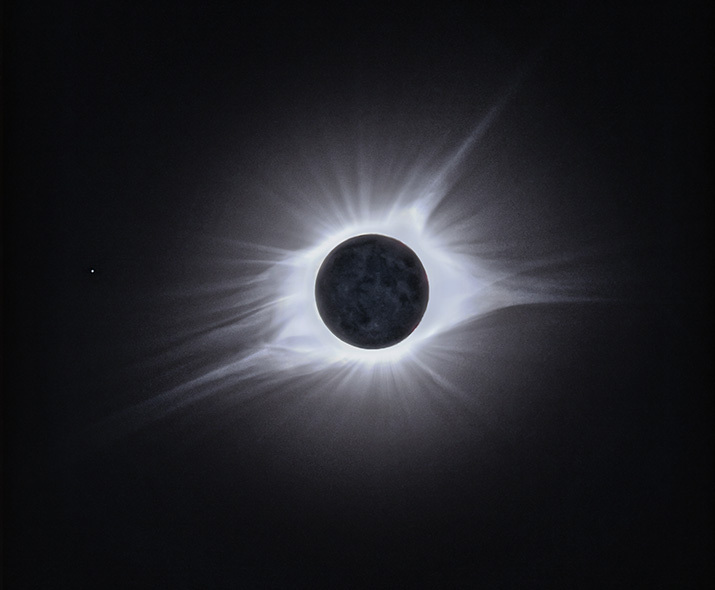 The star visible to the left of the Sun's corona is Regulas. The above image was captured during the eclipse that occurred on Aug. 21, 2017. The path of totality extended across the entire continental United States starting at the Pacific coast of Oregon and ending at the Atlantic coast of South Carolina. This has not occurred since June 8, 1918. The last total solar eclipse visible from anywhere in the mainland United States occurred in February 1979. The next total eclipse to cross the United States will be in April 2024. At that time the path of totality will cross 12 states. An image showing the Baily's Beads phenomena may be viewed here. An image showing the Diamond Ring effect may be viewed here. Member of the Dark Sky Observatory Collaborative.